RETRACTABLE LEASH SYSTEM - This is the "Explorer" version with the new & improved brake & lock system. COMFORTABLE & MODERN ERGONOMIC DESIGN - makes walking your dog a fun experience! 16 FOOT TANGLE FREE LEASH - you have full control of your dog with instant retraction of the leash (and your dog) whenever required. DESIGNED BY A PROFESSIONAL DOG TRAINER - Guaranteed quality design and functionality - For small to medium sized dogs up to 44 pounds. 10 YEAR REFUND GUARANTEE - Industry leading 10 year money back guarantee. Finally, a sturdy, safe and reliable retractable dog lead for your dog! 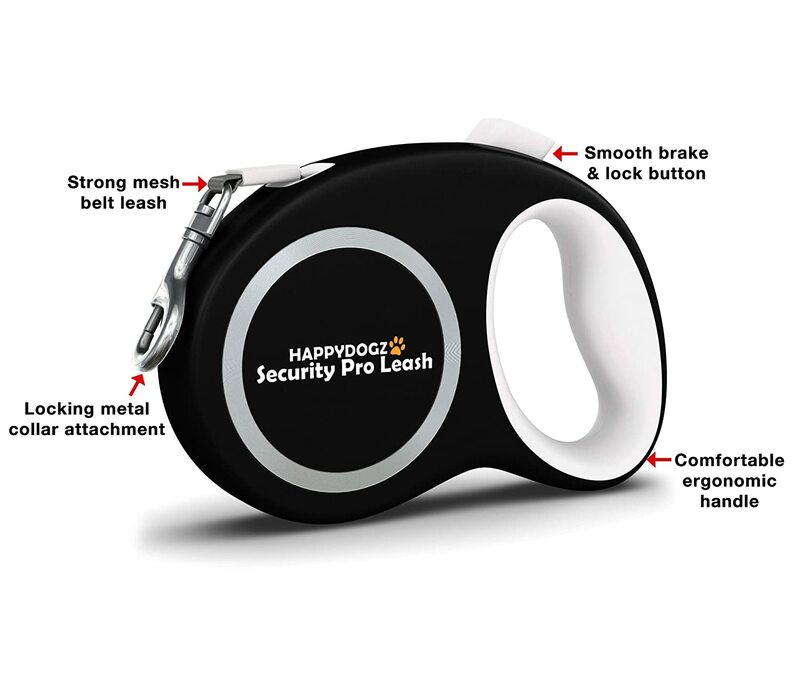 Introducing the Security Pro EXPLORER Retractable Dog Leash from the team at HappyDogz. leashes on the market is even better. SIZES - For dogs up to 44 pounds. foot tangle free leash length gives ample space for you and your dog to enjoy when out walking in public. BONUS: Includes FREE downloadable ebook on how to walk your dog & other training tips. just let us know and we will happily refund your money. Click The Add To Cart Button Above To Get the HappyDogz Security Pro Explorer Retractable dog leash.